Those are typical of what I have been finding historically - nice lines, cool fluting work, and hearts. Nice pieces, Anton! I don't know at this point if I saw a specific pair that these were based on, or if I have just seen a number of them with similar attributes and this is an amalgam of them. Regardless, this is a good, clear example of what's typical. So am I! The wait will be worth it for you guys and gals... and extremely worth it for me. It's the lines, fluting, piercing, and just downright ominous look of the Gothic pieces - especially the German versions, with their more striking lines, longer tails on the sallets, higher degree of ornamentation - that I have fallen hopelessly for. Some of my first memories of armour are of a Gothic harness. I have since dissected a full armour (in my research, not literally) and have handled a few original museum pieces. I spent a good half hour oggling and drooling over a single gauntlet (which was behind glass, fortunately) a few months ago. 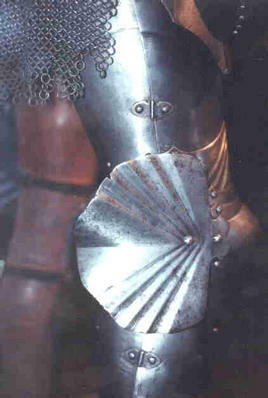 Armour did, of course, continue to evolve past this period, but not to a more beautiful form - at least not to me. I'd love a ton more pictures of Gothic pieces - especially those with a little something special - intricate fluting, roping, piercings, etc. Doesn't matter which piece, full/partial harness, etc. Any that anyone would like to share and discuss would be very, very welcome! More photos of the armour of Archduke Sigmund of Tyrol - with some details and discussion! Excellent details to note here. Check out the brass trim work, and the heavy fluting. Look a little closer, and all the edgework and piercing comes into play. Even the bevor is quite ornate! Even on the thumb of the gauntlet, the piercing work is done at the base and on the lame - and it matches wonderfully with the decorative work on the lames of the leg. This harness is one of the most ornate. Honestly, for my personal tastes, it would be a bit over the top - maybe not so much fluting. The smaller details, though... I'm blown away. Thanks for the picts: That looks fantastic in both senses of the word ! Those long "toes" were an attachment, and were intended for wear while riding. They were detatched for anything on foot. The Gothic style is my favorite also. I've alwayse thought that style of armouring looked to be the most mobile of 'heavy armours', as compared to other styles such as Italian. Perhaps it is only a visual thing, and not a real feature, but that is what attracts me most to the Gothic suits. Regarding hearts, perhaps the heart has a different meaning in germanic (central European) areas even today. For example, during World War II the 'Green Hearts' of JG54 were one of the most successful air combat squadrons ever, and their symbol was most likely associated to the aspect of chivalry and combat, surely not the aspect of love. Well there is no squeezing into that Maximillian armour for me unless I lost 100 pounds and 20" around the waist and had my floating ribs surgically removed, almost as challenging as Victorian corsets for women with 18" waists. Obviously this was before the invention of the BIG MAC. Also not usable by Henry VIII ! But jokes aside, again, very nice pictures. Actually, do you know what size waist one would need to get into this armour ??? Same goes for me... would take drastic surgery. I was actually thinking something on the lines of "Medieval fetish wear" when I saw that particular harness. I have seen some that were more, um... us-like. Not quite as svelte, but still really aesthetically awesome. I have no idea what the actual measurements of this harness would be, but "tiny" does come to mind. Of course, everything is proportionate... and the photo's angle may be a little deceiving. Thanks. Feel free to add to the collection! I still need to see lots of elements and examples! I appreciate your thoughts on this, Cole. I don't know if I'll ever know for certain what the precise meaning behind this was, but I believe this is a probable one. I agree that gothic armours tend to have the appearance of motion - with the sweeping lines, fluting, and pointed elements, I get a sense of motion even when still. I'm not positive what you mean, though, when you say Gothic as compared to Italian. There were lots of different styles of Gothic armour. To me, the German styles are more than the rest. There are some differences that I can illustrate here... generalizations, but typical, I believe. 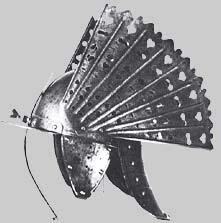 Conversely, the tail on the German sallet tended to be longer and more downswept than that of the Italian style, which was more compact. Italian and other import styles tended also to have narrower faulds (hips or skirt) and tassets (hanging from the faulds, covering the upper thigh), where the pure German style has higher cuisses (upper legs) and wider faulds, and no tassets. This makes the German style look leggier, which probably really gives the impression of a capacity for speed and action. Another typical difference is the addition of a staple or latch to keep the bevor in place on the German style, which is generally absent on other styles. Roped edges and overtly apparent piercing work is also more often applied (or applied more times on the same piece) on the German pieces. Briefly revisiting this thread because I had found some more hearts. 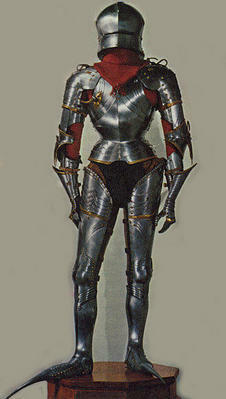 Later than the gothic era but still armour related. Well, it seems that it was not unknown for one to use armour decoration to make a specific, explicit point. Visit this page and scroll down to the Maximillian armour from the so-called "Fico-Group" (near the bottom of the page). It's decorated with rude gestures! Now that's a harness! Can't you just imagine the conversation between the armourer and the young rooster who commissioned it? It's also a good reference for potential "material" for use at living history events. Check out Armour and Castings again - Beathan now has a suit of Gothic armour for sale (at an extremely reasonable price!). From dealing with Beathan, you can customize to your hearts content as well for pretty much the same price. That's one of the pieces Alan had referred to, I believe. The more I see the piercework on arms & armour, the more I like it. Anywhere from along the laminations of plates on the Gothic harnesses, to the fullers of rapiers, to baskethilts... it's just stunning. I had seen this before, and forgotten about it! THIS would be something I would most definitely have wanted, had I been in the position to have it. Come to think of it, I'd love to have it today! Quite arrogant, cocky... yet understated - you wouldn't notice this from afar. It's like a bumper sticker that, beside a big smiley face, reads (in smaller print) "If you can read this... F*** OFF!". I'd love to step into that personna in a living history event. Taking the meaning of the gestures out, just looking simply at the decorative elements and the craftsmanship that went into this... just phenomenal. Thanks for posting this, Sean! Blows me away. Yes... the judicious application of lessons learned... Amazing what one can learn from the study of period art! Strange that they use the French (?) term "Salade" for the helmets instead of calling them "Schaller" or "Rennhut". I share your sentiment, Wolfgang! If I could pick any era, any location to have a personal harness, mid to late 15th Century German High Gothic would be it, hands down. These harnesses in this picture are awesome! Thanks for posting them for us! Many of the other ones I've seen didn't have the bessegews - I rather like them.